Saturday after my long day of work in Sagamiono, I went to the 'Buya' and met up with M. and A. We were originally going to walk to Harajuku and go for dinner. 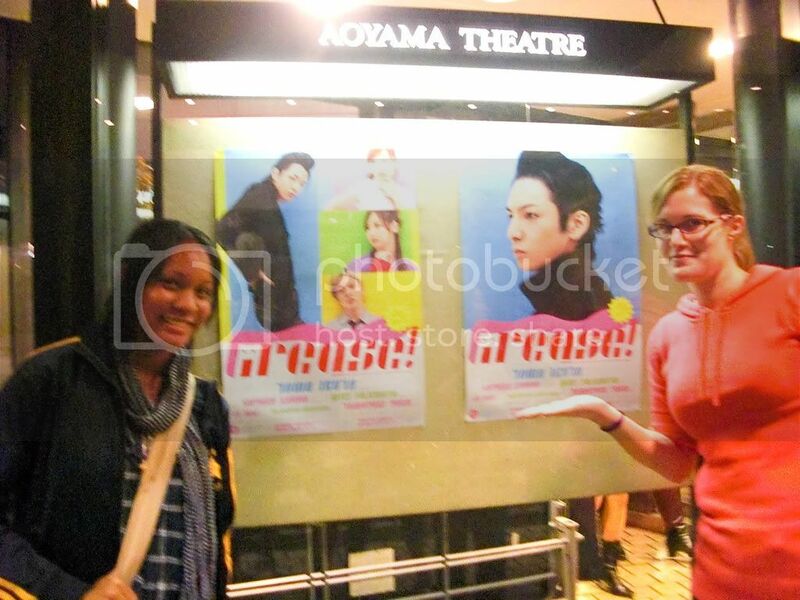 But in the end we were passing by Aoyama Theater and suddenly in flashing letters we could see that Grease was playing. And when I say flashing letters there was this huge sign with Grease spelled out. XD So impulse buying, 5 mins before the show started we got a ticket. A standing seat, yea makes no sense, we got to stand in the 2nd floor in the center back. We weren't even aloud to sit down on the floor, which sucked a bit, but with no time to think the show started. I will just talk in general what I thought about it. Danny was played by Toma Ikuta. Rizzo by Miki Fujimoto. Doody by Go Ueki. Kenickie by Tomoyuki Yara. Plus more... Turns out there were Johnny guys in the play. Toma (Hana Kimi) and Tomoyuki. My first time seeing Johnny boys on stage. The first act went well. I enjoyed it. But the 2nd act was where I was impressed. Toma was just amazing. His dancing is singing just wow'd me. I was hoping that the dancing would be a little better, but they had their moments of amazing dancing. There was a few new kinds of dancing, like a part where it was 'Grease Lightning" they did a special piece for driving around and I enjoyed it a lot. I really enjoyed seeing a stage performance of something that I grew up with. Something I knew. Something I can compare to the American Version. It was really good, but not as great as I would have thought it would have been. It did its purposed and I really enjoyed the show. And I would defiantly be ready to go see it again...when the prices are lower XD or I have a seat to sit in.